I mentioned these in my Meatloaf post and I think I’ve finally conquered this family recipe. When I was younger and thus our children were younger, I made this many times but was always in a rush, always trying to shorten the procedure. But I have realized, to get the meatballs the way I want, there are no shortcuts. Ah, one of the better things about getting older: more patience. Well, no, maybe what it’s all about is that there are no small children around anymore and the fact that I have more time to make dinner. 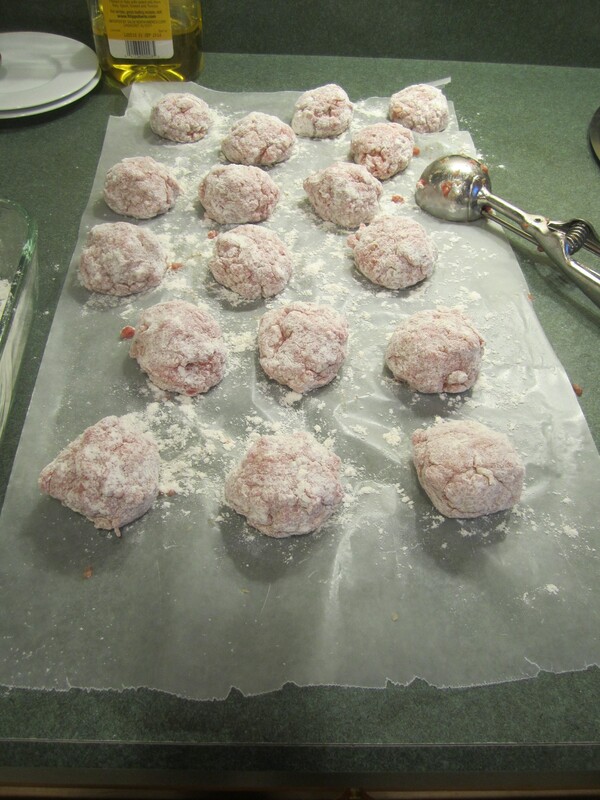 The meatballs need to be on the smaller size (I would make giant meatballs), each meatball must be coated with flour (I always eliminated this step because I thought it was a waste of time….not! 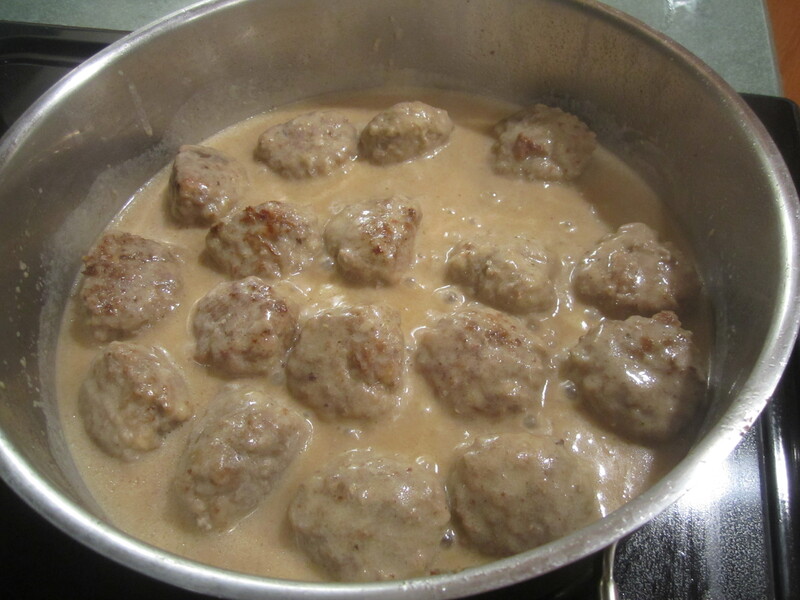 ), and the meatballs need to be cooked half at a time in a large fry/saucepan, so they get nicely browned all around and somewhat firm. (I would jam all the meatballs together in a smaller fry/saucepan and they would always turn out soft, and fall apart). 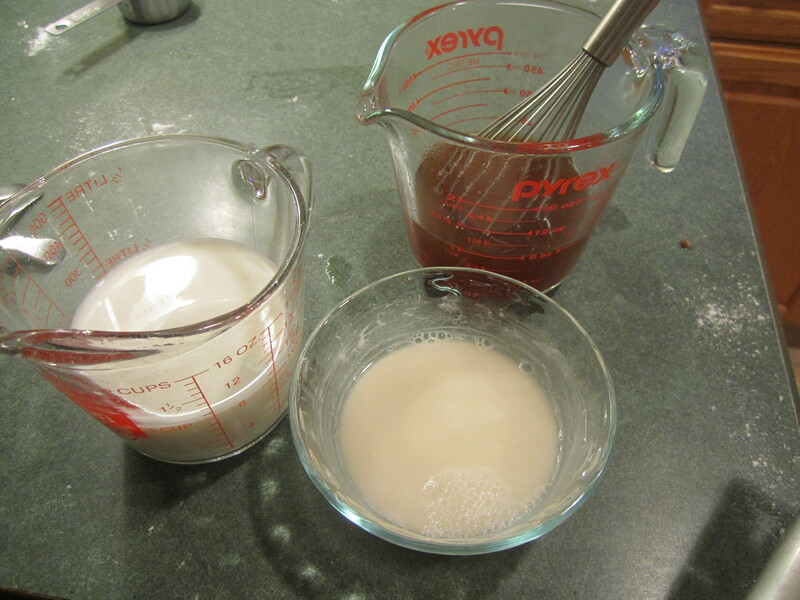 My only tweak on the original recipe was to double the liquid for the sauce but not the flour/water mixture. I made them last night and my husband complimented me saying he didn’t remember them tasting this good. Success! 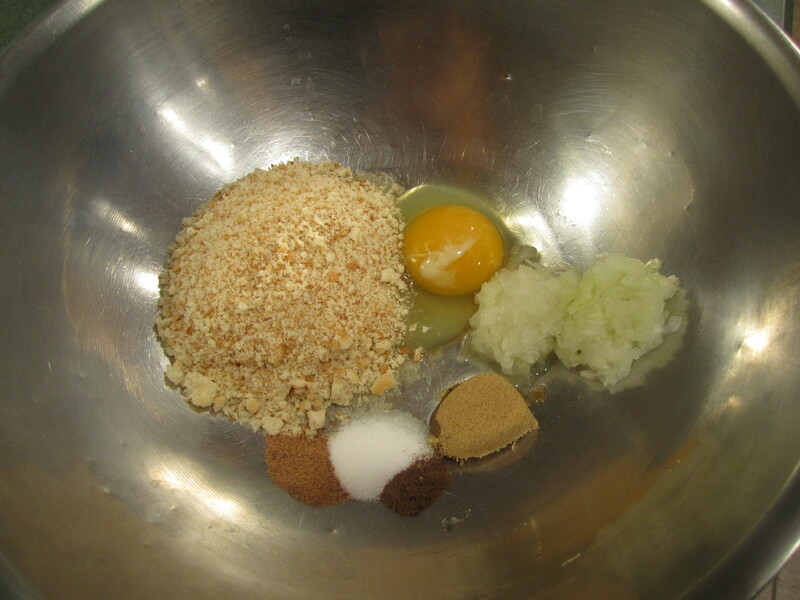 Combine egg, milk, salt, onion, bread crumbs, nutmeg, allspice and brown sugar in large bowl. Stir with a large serving fork to combine. 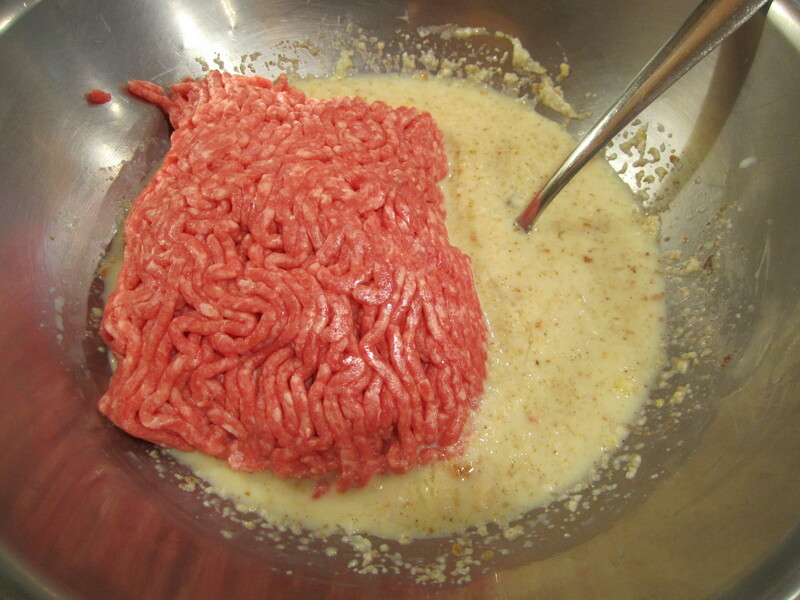 Add ground beef and stir with fork until just combined. In a large saute pan, add butter and olive oil and heat over medium heat. 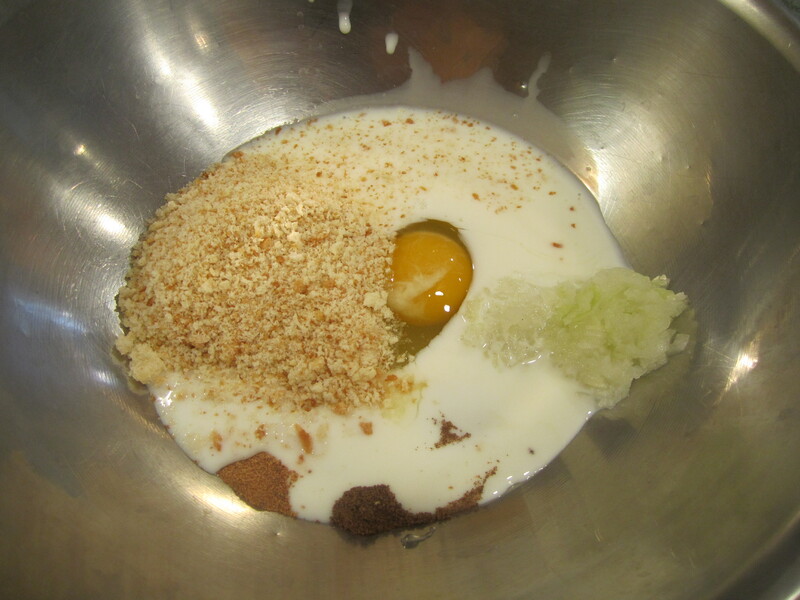 While butter and oil are heating up, put 1 cup flour in a glass baking dish or wide bowl. 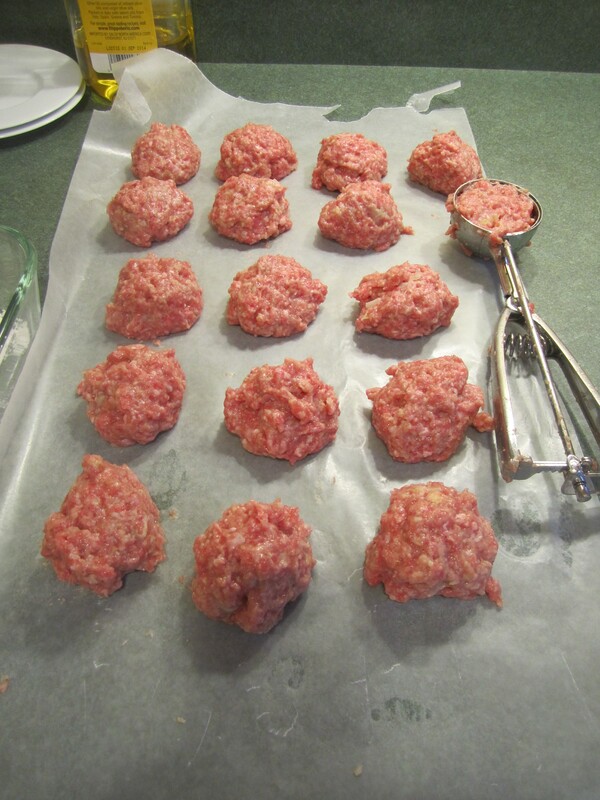 Shape meatballs slightly bigger than a golf ball (an ice cream scoop is helpful) and set aside on wax paper. 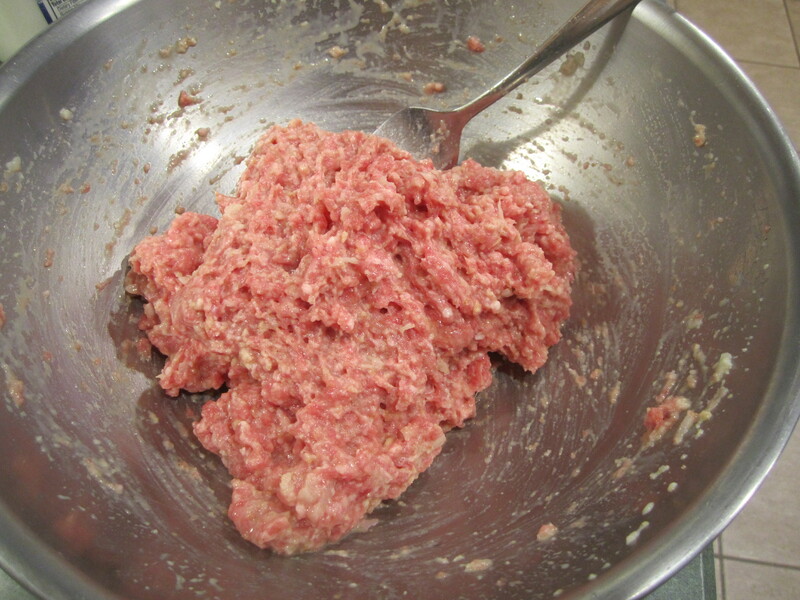 When all meatballs are shaped, take one, place in bowl with flour. 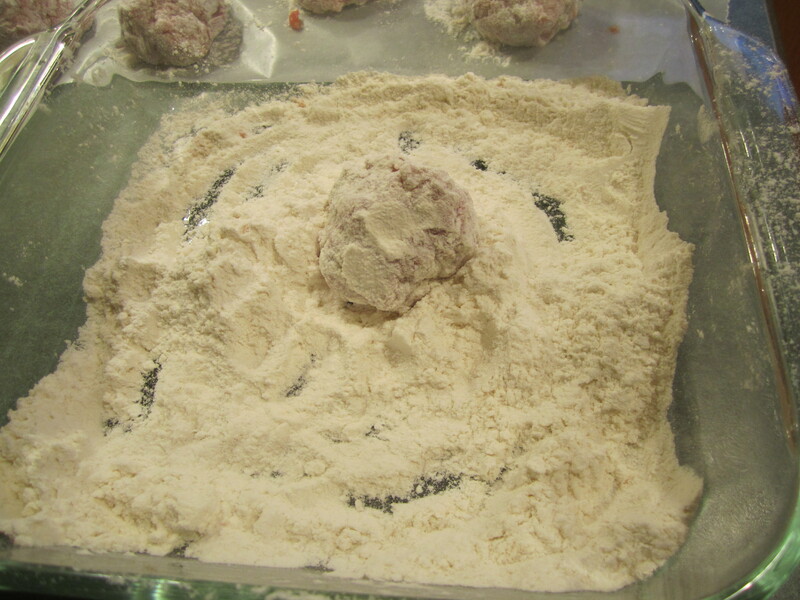 Cover meatball gently with flour. 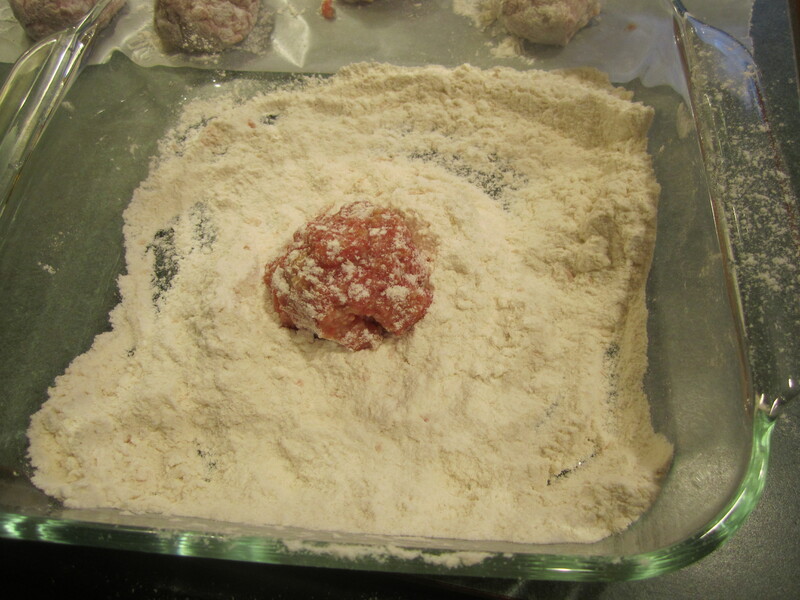 Remove meatball and toss gently back and forth in your hands to remove excess flour. You should have a nice coating of flour. 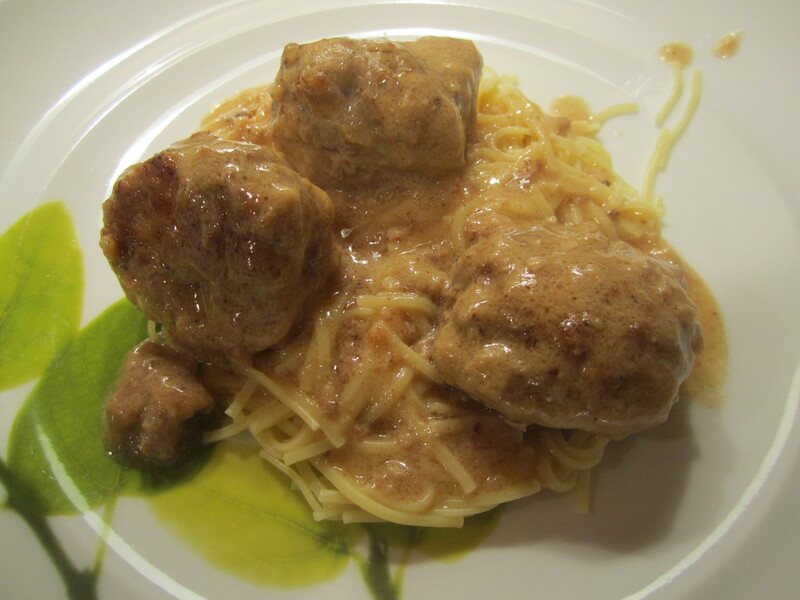 Continue with all meatballs and set aside. Place 1/2 the meatballs in the saute pan. Brown the meatballs for a total of 5 minutes, turning over gently 1/2 way through cooking time. You might need to add an additional minute or two. You want the meatballs nice and brown and they should feel firm, not soft. 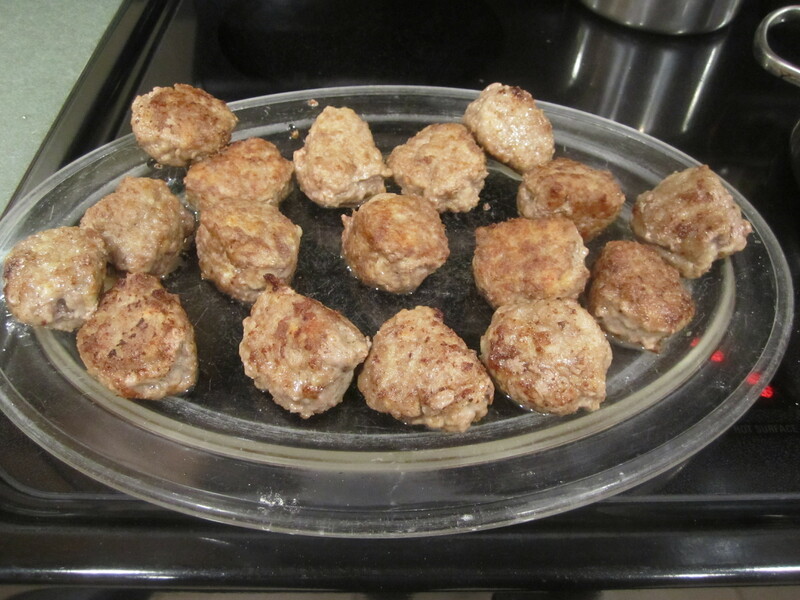 Remove meatballs from saute pan onto a platter and repeat procedure with the other half of meatballs. Place the 2 tablespoons of flour into a small bowl and add the 1/3 cup of water, stirring with a whisk or fork until combined. 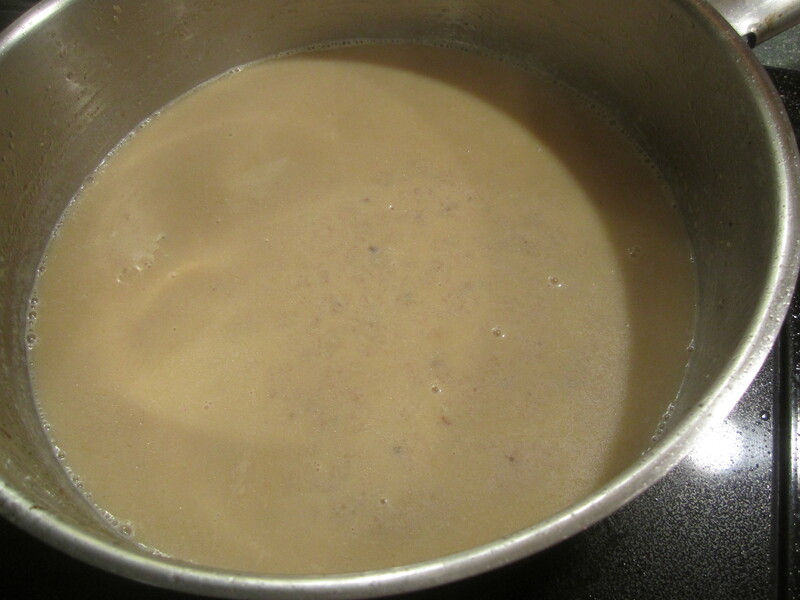 Place beef broth, milk, and flour mixture into saute pan and stir with a metal spatula or whisk until combined, loosening up all brown bits from bottom of pan. Bring to a simmer. 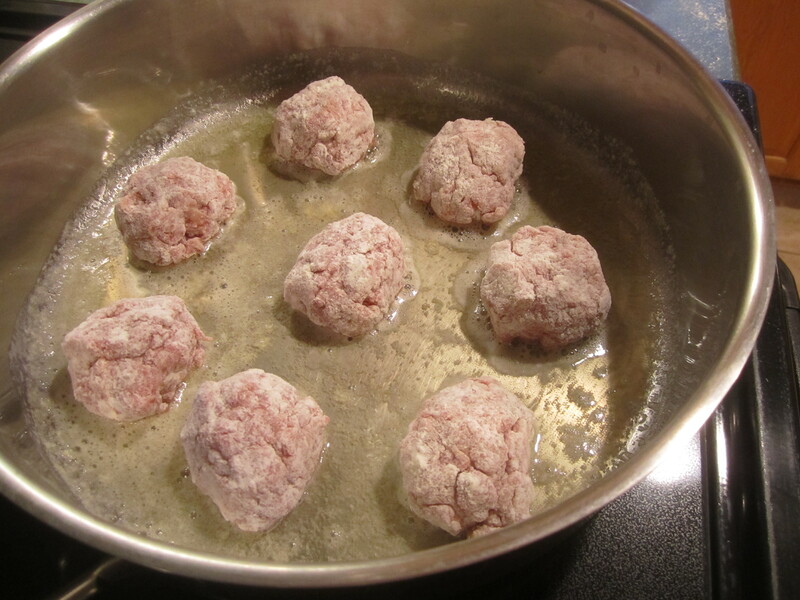 Add meatballs back into saucepan and bring everything back to a slight simmer, one notch below medium. Check to make sure meatballs are not sticking to bottom of pan and if they are, take a metal spatula and gently release them from the bottom. Cover and simmer for 20 minutes. 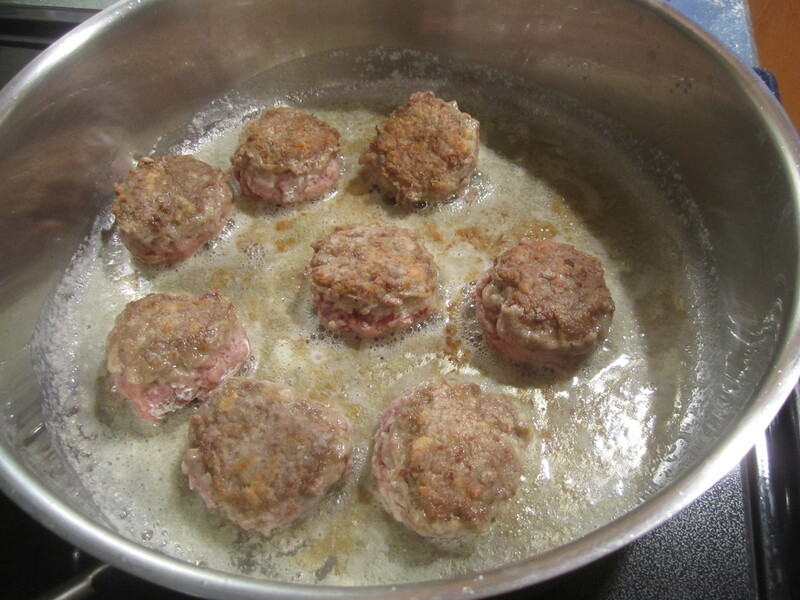 Half way through cooking time, check the meatballs again to make sure they are not sticking and if they are, release them gently with a metal spatula. 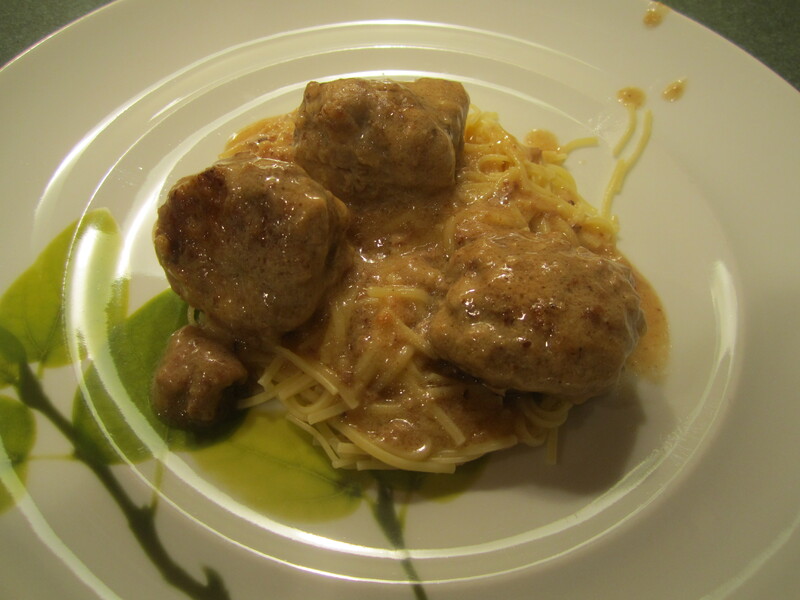 Serve meatballs with mashed potatoes or noodles or just the way they are!